First thing that caught my eye was this Scirocco. I had no idea anyone had one of these in the US. I dont know how the owner got it here (if anyone does, please chime in!) but I'm sure glad he did cause the car looked awesome. The next car that stood out was this stunning Porsche 356, probably my favorite car at the show. Unfortunately the light on it was less than ideal so only a couple of my photos of it turned out. This Porsche 911 GT2 looked surprisingly good with the yellow wheels. And then there was this beauty... One of my favorite cars of all the time, the Jaguar XKE. Was upset to see this gorgeous Mercedes 300SL Gullwing drive away before I could get a good shot of it. Oh well, better luck next time. This Morgan Aero 8 was a surprise. I haven't seen one outside of Monterey. This Phantom Coupe was parked far from all the other cars. So was this rare and often unloved Ferrari 456. So after Cars and Coffee wrapped up we headed on our way to get something to eat when something caught our eye... 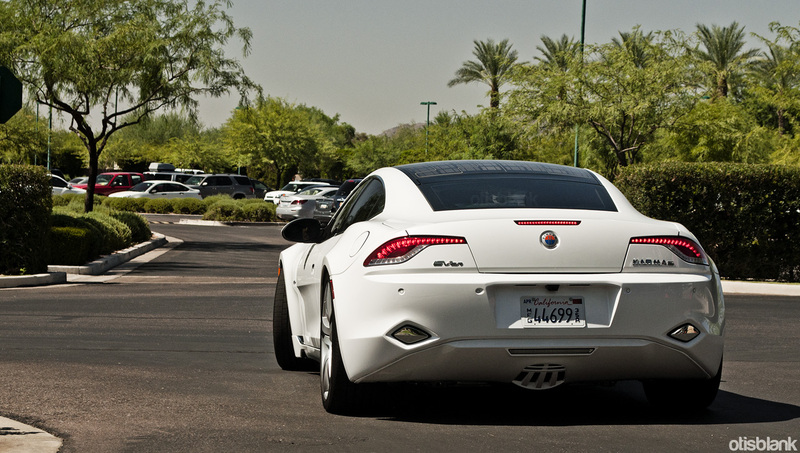 It was a white Fisker Karma sedan on the streets of Scottsdale. We did the most logical thing which was following it. It lead us to a little invite only test drive event where there was another Karma, this time in black. For anyone who hasnt seen one of these in person, photos don't do this car justice. It is a true stunner in the flesh (metal? carbon?). We didn't feel all that welcome at the event but there was no way I was gonna leave without snapping some photos. Once the white Karma left so did we. All in all it was a pretty good day. Can't wait to come back when the weather cools down and the cars come back out again!